The use of the 797 designation could be a nice round off for a 60-year cycle since the introduction of the Boeing 707. But why do we need another Boeing model and what is Middle of the Market? Middle of the Market(MoM) is a term Boeing coined back in 2005 which described their then MoM solutions, the Boeing 757 at the top end of the single-aisle market and the Boeing 767 at the bottom end of the twin-aisle market. Those two venerable workhorses have been out of production for some time now which is why Boeing is concerned about this sector of the market. So where does Middle of the Market lie? One could be forgiven for thinking that the 737 is growing bigger in the form of the 737 MAX and there is a smaller 787, the 787-8. However, let’s take a closer look at how those two aircraft compare. Looking at the figures above you can get an appreciation for the large gap between the largest 737 and the smallest 787. To service this section of the market, airlines have to either underutilise their 787s or schedule more frequent services with their 737s. Neither option is very financially desirable which is why Boeing is looking at a completely new design for this niche in the market. Sources indicate, and Boeing themselves have made announcements at the last Paris Airshow, that they expect to begin design work on what has unofficially been named the Boeing 797 or the MoM in 2018. The expected Entry Into Service (EIS) is 2024-2025 however, some sources indicate this could slip to 2026. So what will the anticipated new model be like? General design requirements call for an aircraft that can manage a range up to 9,630 Km (5,200 nmi), around 10 hours flying. This will enable the aircraft to be used on routes such as the North Atlantic where it would be small enough to operate into and out of smaller city airports, avoiding the traditionally overcrowded main hubs. For passengers, the benefit will be to be able to fly to far off destinations from their home airport without inconvenient connections along the way. The carrying capacity will, of course, depend on the carrier’s choice of configuration of the passenger cabin. The passenger carrying range is targeted for 220 – 270. The new design will require a new range of engine with thrust in the 45,000-50,000 lbs range. Boeing has specified a requirement for a geared turbofan. This is where a gearbox sits between the big fan at the front of the engine and the internal turbine. This enables greater control over the engine with the ability to maximise the efficiency of engine speeds at different stages of flight. CFM, which is 50% co-owned by G.E. and Safran, have indicated they will be competing with Rolls Royce to produce such an engine, whilst Pratt and Whitney will offer an upgraded version of their GTF engine. Boeing is confident in this sector of the market and estimates that they will be able to sell 4,000 797s over a period of 20 years. Airbus for their part are confident that their current offerings of the Airbus 321 NEO and A330 NEO will cover them, however, they haven’t ruled out the possible addition of an A322 to the Airbus family. Construction of the B797 is likely to draw on lessons, new techniques and new materials that have gone into the development of the 787 as well as the 737 Max. The wings and fuselage will be made primarily from carbon fibre materials, as is the larger 787. 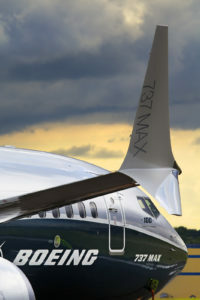 We may also see the split winglets which are a feature of the 737 Max. These will increase the wing lifting area, giving better fuel economy without the penalty of greater wingspan. The benefit of maintaining a lesser wingspan is to enable the aircraft to fit into smaller gate areas at smaller airports thus enabling the concept of flying between more regional centres. No doubt as design decisions are laid down, we will get a much clearer idea of how the latest Boeing offering will look. Meanwhile, 2026 seems a long way off. To bridge the gap, Boeing is seriously considering reintroducing the 767 300ER as an interim measure. It is a decision that has been on again, off again, but apparently, it is currently in an on again phase. The last off again phase was due to the production of the 787 being lifted from 12 to 14 per month, but we assume this roadblock has been removed. Let us see what the future brings. If you know any more about the Boeing 797 or MoM, please feel free to comment below. Boeing has the 737 and the bigger 777 and 787. The new airliner is likely to be a variation of the 767 with 7 abreast seating. I think it will replace the 767, 757 and the higher capacity versions of the single aisle airliners. yes, it is sort of a tweenie between 737 single aisles and the larger twins.